More than 200 students got some help deciding their career paths at the sixth annual Information Technology / Operations Management (IT/OM) Career Day. Thirty alumni and young professionals from the information technology and operations management fields shared their stories during 30-minute interactive sessions on "A Day in the Life of a ... Professional." The afternoon included a keynote address by Jane Cooper, vice president of Nuclear Safety Enhancement Services with GE Hitachi Nuclear Energy. The day ended with a "meet and greet" event where 25 local and regional employers interviewed information systems, operations management, computer science and undecided business majors, as well as students pursuing a Master of Science in computer science and information systems students for potential internship opportunities and full-time employment. The goal of the event was to help students determine if IT/OM is the appropriate major or second major for them, assist juniors and seniors with internships and share full-time employment opportunities with seniors and recent graduates. Students from the UNCW, Appalachian State University and Baylor University chapters of Pi Sigma Epsilon (PSE) gathered at UNCW Oct. 21-23 for the 2011 Atlantic Regional Conference 2011. They attended guest speaker lectures, competed in individual and group competitions, and attended a career fair. The conference included development seminars, networking opportunities, the regional Pro-Am Sell-a-Thon, the national speaker's competition and guest speakers. The highlights of the convention included a keynote address by representatives of Target Corporation and a career fair featuring ADP, Castle Branch, Enterprise, Federated Insurance, Northwestern Mutual Financial Network, Paycom, Proficient Learning, Sherwin Williams, Target, TEK Systems, Tom James, University Directories, Vector Marketing Corporation and WWAY News Channel 3. Attendees also participated in chapter roundtables, where they were able to share insights and ideas with members from other chapters. Planned social events included a night at Jungle Rapids as well as an awards banquet on the Henrietta III riverboat. Five of the 48 UNCW students who attended also competed in the Pro-Am Sales Competition; three UNCW students competed in the National Speakers Competition. UNCW seniors Jordan Jeremias and Kevin Smith tied for runner up in the Pro-Am Sales Competition. UNCW chapter president Jaclyn Healy won first place in the National Speakers Competition. Winners were awarded complimentary registration packages for the five-day PSE National Educational Foundation Sales and Marketing Convention which will be held in March 2012 in Indianapolis, Ind., where they will have opportunities to compete for awards and prizes. During the conference, Jeremias and Smith will compete in the national Pro-Am Sell-a-Thon while Healy will act as the master of ceremonies for one of the professional programs. Jeremias said the event made him "more driven to compete to better myself and those around me." Graduate Lauren Taylor earned with a job offer as an executive team leader at Target in Myrtle Beach. Overall, the students who attended believed it was a great experience that will provide benefits to last a lifetime. Members of the UNCW Department of Information Systems and Operations Management hosted more than 200 people from six countries at the 2011 Information Systems Educators Conference (ISECON) and Conference for Information Systems Applied Research (CONISAR). The conferences were aimed at information systems professors with the goal of sharing the latest information in IT research, education and technology. 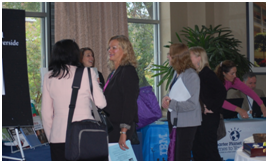 Workshops and panels in model curriculum and teaching technology were also held. More than 15 professors were recognized for their research in the information systems profession. UNCW information systems professors who served on the host committee as well as session chairs were Tom Janicki, chair of the conferences; Bryan Reinicke, chair of the host committee; Judith Gebauer, Douglas Kline and Ulku Yaylacicegi. Cameron School of Business Dean Larry Clark and Tim Mellitt, CIO of GE Hitachi Nuclear Energy, were among the featured speakers. Mellitt spoke on the need for more technology savvy students with strong business acumen. Clark discussed how important it is for information systems graduates to have the skills necessary to permit them to self-learn in the rapidly changing field of information technology. The conference featured a dinner on the Henrietta III and tours of the Battleship USS North Carolina as well as a tour of downtown social establishments lead by Doug Kline. While Wilmington was the smallest city the conference has visited, it had the highest ratings of any conference for the past five years. As a result conferences' success, Tom Janicki will be chair of the 2012 conferences in New Orleans. Program directors for the International Business School Alliance (IBSA) traveled from England, France, Germany, Spain, Russia and Malaysia last fall for a two-day working conference at the Cameron School of Business to strengthen alliance processes and develop strategies for the future. Picking up from the summer theme, directors further developed the launch of the new IBSA website IBSAWORLD.net. Based on research, this recruiting tool has already proven successful in attracting potential students from all over the world. Administrative functions such as the development of a director's handbook, improvements on the student handbook, approval processes for new members, specialization selection and changes, joint resource commitments, quality assessment processes, growth strategies and consideration of pursuing EPAS accreditation were among the variety of topics discussed. Each spring, program directors, as well as faculty and staff, work jointly on course content and shared delivery processes. These activities help develop a strong international experience for CSB faculty and staff. The sharing of international insights and working through joint academic issues help make this alliance a powerful learning experience for CSB students. Although not a program requirement, CSB students are encouraged to conduct meaningful internships while abroad. Working through the Cameron Executive Network, relationships are forged with companies located in partner countries. This year, seven students are in the process of finding international internships while they complete their master's thesis. It is the combination of international study and work experience that creates strong employees for regional, state and U.S. companies. Over the past few years the CSB has hosted students from 13 countries. Those graduating from the program have secured professional positions throughout the U.S. and around the world. "The quality and reputation of this program grows stronger each semester," said Rebecca Porterfield, director of international business programs at CSB. Individuals interested in the program can go to the CSB graduate programs website for more information. Moody's, the New York Fed, Bloomberg, J.P. Morgan, Deutsche Bank and Barclay's Capital were the major stops on the itinerary for 33 economics and finance students during their Dec. 19 trip to New York City. Accompanying them on this fifth annual visit provided by the Department of Economics and Finance were Tom Simpson, Executive in Residence; Bill Sackley, associate dean; Adam Jones, assistant professor of exonomics; and Barbara Hoppe, administrative assistant. During the presentation at Moody's students learned about the agency's procedure for assigning ratings on corporate bonds and how the agency has been responding to concerns following the financial crisis. The New York Fed presented an overview of how the Fed implements monetary policy, the Fed's response to the economic crisis, an insider view of the Bear-Sterns bankruptcy and how the Fed responded following 9/11. Bloomberg exposed the group to its unique corporate culture, provided a tour of the midtown facility and led a discussion of career paths within the company. During the visit to J.P. Morgan, students had the opportunity to speak with Jim Glassman, J.P. Morgan's head economist, and Jamie Paterson, the bank's head of funding, about the bank's economic outlook and differences in the prospects for the American and European banking systems. On the final day, the group visited Deutsche Bank for a presentation on the macroeconomy and a discussion at Barclay's Capital on the evolving market for leveraged loans. Students also got an opportunity to network with Cameron School of Business alumni working in New York during a mixer T.G. Whitney's and during some of the group presentations. 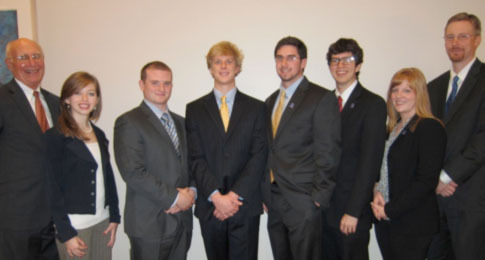 UNCW's Fed Challenge team participated in the Federal Reserve System's Fed Challenge competition Nov. 1 in Charlotte. The event was the culmination of a yearlong process of researching the economy and Federal Reserve policy, preparing a PowerPoint presentation and a steady diet of answering questions and responding to scenarios from professors and CEN members who were invited to practice run-throughs. The competition required teams of up to five students make a 15-minute presentation on the economic outlook and make monetary policy recommendations to a panel of judges. This was followed by questioning from the judges. This year's team consisted of Davis Ann Talton, Lindsey Sackett, Thomas Jacobs, TJ Carstens and Adam Beame with Mark Grossman serving as an alternate. The team was coached by Thomas Simpson, Executive in Residence, and Adam Jones, assistant professor of economics. While not placing in the top two this year, the team received very favorable comments from the judges, a reflection of the excellent work performed by the students. 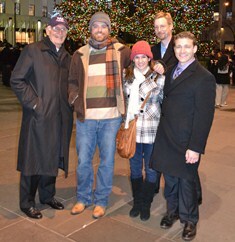 The national winner of the 2011 national Fed Challenge competition was Harvard College. Communication and relationships will be enhanced if one has an understanding and empathy for the cultural background of international stakeholders, according to Mark Peterson. Peterson, the Ghert Hofstede Chair and Professor of Management and International Business at Florida Atlantic University, discussed how cultural and international relations affect the way organizations should be managed in a Nov. 5 presentation to Cameron students, faculty and staff. He also addressed the challenges facing future employees and managers working for or interacting with international businesses. This information was especially relevant to students in the Cameron School of Business International MBA and Professional MBA programs who are working for global organizations, such as PPD, General Electric and Corning, and a growing number of Cameron graduates who are accepting positions with global enterprises. The author of more than 90 articles and chapters on international business, Peterson also met separately with International MBA students to discuss the impact of culture on research in a variety of business functions, i.e. international finance and investment, international human resources and international marketing. IMBA students are required to complete a thesis on an international topic as part of their program. For example, research has shown that Chinese have substantially different personal investment strategies than Americans which is explained by their cultural differences. Peterson fielded questions from students and faculty at a reception in the Swain Center following his presentation. Almost one year ago, a task force was formed to review the Professional MBA program in the UNCW Cameron School of Business and to make strategic recommendations to improve it. Under the direction of Steve Mahar, assistant professor in the Department of Information Systems and Operations Management, the task force is close to presenting its recommendations to the Cameron faculty for approval. Alumni surveys, research on MBA programs at peer and aspirant schools, profiles of top-ranked MBA programs, discussions with key stakeholders and numerous articles and research on best practices at MBA programs globally were investigated prior to the formulation of task force recommendations. customization of elective offerings which will allow students to take courses from other departments and universities that match their career focus, e.g. students taking online courses in health care administration from ECU that count toward their UNCW degree. Final recommendations will be presented in an upcoming edition of Cameron Insider.